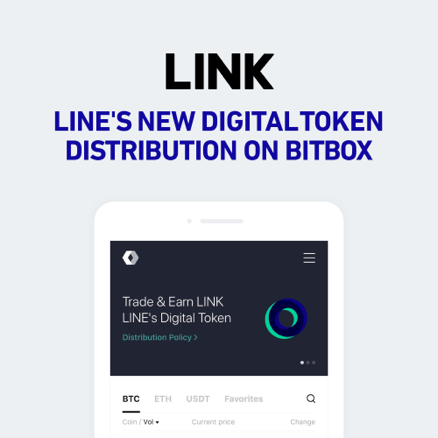 TOKYO – September 4, 2018 – LINE Corporation announced today that its digital asset exchange BITBOX has begun distributing LINE’s new cryptocurrency LINK (link.network) as compensation for trading on BITBOX. While the compensation rate will be subject to change, for the rest of September all users on BITBOX will acquire 0.1% of their trading volume as LINK. “Trading volume” includes all buying and selling (but excludes self-dealing), and there is a daily maximum of LINK for each account, equivalent to USD1,000. BITBOX’s daily LINK distribution limit is USD2,000,000 worth of LINK. The acquired LINK can be checked with each user’s “Balance” tab. As LINK will be traded on BITBOX, its market value will vary depending on market trades of LINK on BITBOX. However, LINK distributed by BITBOX as compensation will have a minimum floor value of USD5. Furthermore, to promote the launch of BITBOX, the exchange is eliminating the trading fees for all BITBOX users until September 20. Unlike other cryptocurrencies or digital tokens, LINK did not make an Initial Coin Offering (ICO), but instead utilizes a reward system that gives users LINK as compensation for using certain services within the LINE ecosystem. LINK can be used as payments or rewards within the dApp services that will launch soon, and for service categories like contents, commerce, social, gaming, exchange and more within the LINE ecosystem. In addition to compensating users for their contributions, BITBOX is also committed to protecting their assets, utilizing both strong security measures and insurance to keep users safe against security attacks. Based in Singapore, BITBOX is a digital asset exchange operated by LINE Tech Plus, under both LVC Corporation and LINE Corporation. Launched on July 16, 2018, BITBOX lists around 30 coins and supports 15 languages. BITBOX focuses on providing a user-centered experience through first-rate customer support, along with the highest levels of security and transparency.